The current run of Tomb Raider comics, Survivor’s Crusade, is drawing to a close on April 4 but Dark Horse has announced that Lara Croft will be back for yet another adventure and, this time, she may have met her match. The new four-part mini-series, Tomb Raider: Inferno, will be written by Jackson Lanzig and Collin Kelly, the duo responsible for Survivor’s Crusade, and sees Lara take on Trinity once more. But, this time, the sinister organization has a trick up its sleeves: a new operative who’s prepared for anything our heroine can throw at them. Fans of Mariko Tamaki’s 2016 series will be thrilled to hear that artist Phillip Sevy – who provided the exquisite interior art for Tamaki’s series – will be joining Lanzig, Kelly, and colourist Michael Atiyeh for this new project. Atiyeh is another returning franchise veteran; his previous work includes the 2016 series, the five-part mini-series Lara Croft & the Frozen Omen, and, most recently, the Survivor’s Crusade mini-series. While some fans may be suffering from Trinity fatigue, Lanzig has promised that there will also be plenty of archaeological antics in the new series, including “the oldest tomb in the world – a seemingly endless pit that only gets more and more incredible and mysterious the further down you go”. Survivor’s Crusade has had mixed reviews thus far but the writers have highlighted the arc’s importance to Lara’s growth as a character. As Lanzig put it, “Survivor’s Crusade brought readers into Lara’s long dark night of the soul” and that she has been “pushing away her friends, her legacy, and her hope for a normal life in the pursuit of bringing down Trinity”. 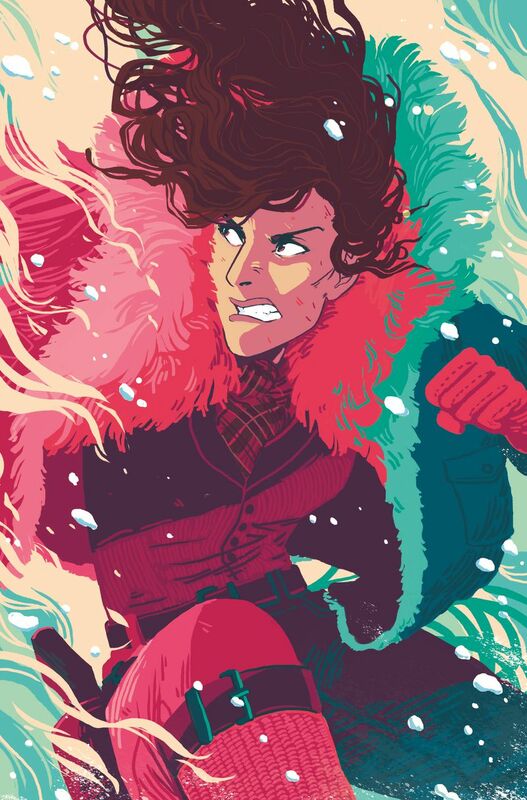 Hannah Templer’s cover art for Tomb Raider: Inferno #1. So, what does this mean for Lara in the long-run? “We’ve been slowly sharpening the weapon that is Lara Croft,” Lanzig explains, “Now, in Inferno, Lara’s unleashing that weapon against the enemy. Trinity’s only hope lies in a weapon of their own – a new character who hits out story like a wrecking ball in Issue #1″. And, finally, artist Hannah Templer will be providing the cover art for Inferno #1. If you’ve been following Survivor’s Crusade, you’ll already be familiar with her bold, quirky, colourful style and her upcoming work is no exception. Tomb Raider: Inferno #1 will be out on June 13, 2018.